That claim is likely to end up in court, along with a barrage of sign-related lawsuits that have put a huge strain on the time and resources of the City Attorney’s office. But regardless of whether the signs are ultimately allowed, the approvals cited as giving the developer a “vested right” were so lacking in genuine public input and debate as to make a mockery of the principle that people have a right to formally voice their opinions on government decisions that affect their neighborhoods and communities. Because the property is in a community redevelopment area, and the city’s 2002 ban on off-site and supergraphic signs allows exceptions through CRA agreements, the developer, DS Ventures, came to the CRA with a proposal to put up two supergraphic signs, one 82 ft. high by 69 ft. wide on the east side of the building, and one 80 ft. high by 24 ft. wide on the west side. The property is also in the Hollywood Sign Supplemental Use District, which allows exceptions for supergraphic signs but requires developers wanting to put up these signs to conduct a “sign reduction” program. This calls for removing one sq. ft. of existing billboards, pole signs, or roof signs in the Hollywood Community Plan area for every two sq. ft. of new supergraphic signage. To meet this requirement, DS Ventures would have had to find and remove the equivalent of almost six full-sized billboards. Leaving aside the question of whether “sign reduction” is the proper term for a provision that allows a doubling of outdoor advertising space, the city’s municipal code also allows the CRA to enter into agreements with developers that supersede the regulations of the sign district. And that’s exactly what happened. Five months after the CPC approved the zone change for the property, the CRA approved the signage agreement with DS Ventures requiring the removal of only one billboard, along with the payment of a one-time fee of $50,000 for streetscape improvements on Sunset Blvd. And in a highly questionable twist of reasoning, the CRA found that the signs would have no significant environmental impact and therefore the environmental impact report (EIR) prepared for the earlier zone change would not have to be revisited. This finding came even though EIR’s are required to study the impact of projects on viewsheds and the visual resources of a community. Now fast forward to June of last year, when DS Ventures took the next step in getting approval for the signs, which was a review by the city planning department to determine compliance with the Hollywood sign district regulations. While the planning department has sometimes taken heat, deserved or not, for moving slowly on approving projects, in this case planners moved with remarkable alacrity, producing eight pages of approvals, findings, and conditions in just over six weeks. One of those conditions was the following: “Approval of this project does not waive compliance with any of the requirements as determined by the Department of Building and Safety or any other City agency.” The developer didn’t immediately apply for permits, however, and late last year the city adopted a moratorium suspending issuance of any permits for new off-site or supergraphic signs. Then in August of this year, when that moratorium came under legal attack, the City Council approved a permanent ban, which DS Ventures apparently believes does not apply to its project because it has “vested rights” to these signs. So let’s look at the process that led to the assertion of these so-called rights. The only official notification and public hearing came back in 2006, when the CPC met to consider the zone change and some other approvals needed to convert the hotel to apartments. Those supergraphic signs were not even on the table at that time. Next came the CRA sign agreement, approved in public session by the CRA board but put together by the CRA staff without any mechanism for giving people who would see huge advertisements from their homes or apartments or drive or walk by them regularly a voice in a decision having a profound effect on their surroundings. Likewise, the planning department review all but precluded any possibility that members of the public would have a voice in the process. For example, the project is within the boundaries of the Hollywood Studio District Neighborhood Council, but according to a board spokesperson the supergraphic sign issue was never brought before the group. The city’s blitheness in failing to solicit public input on a project of the kind already generating much debate and controversy in the Hollywood community and elsewhere is disturbing enough. But what of the precedents set if the developer succeeds in putting up these signs? The difference between this building and others plastered with supergraphic ads is the fact of its being an apartment building. Will residents of these 52 apartments either not notice, or not care, that they are looking out through an advertising sign? (For an idea of what that’s like, just take a ride on an ad-wrapped MTA bus) What if there’s a fire and firefighters have to break through a window to get someone out? Will they be slowed down? These are not idle questions, but have already been raised by city fire department officials in connection with supergraphic ads put up on office buildings. And finally, the CPC last December approved revisions to the Hollywood Sign District regulations that would, among other things, reduce the supergraphic sign credit for billboard removal from 2 to 1 to 1 to 1, and prohibit supergraphic signs from covering any windows. And in March, it approved a new citywide sign code that also prohibited supergraphic signs from covering windows, and removed the ability of the CRA to make sign agreements that supersede city regulations. Neither of those has been acted upon by the City Council. 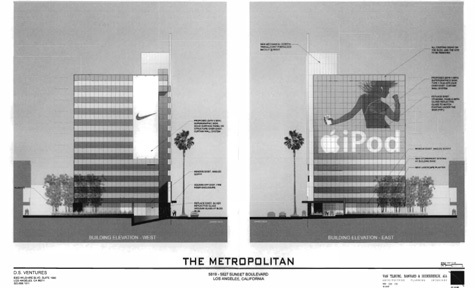 The Curbed LA article cites a bankruptcy court document stating that DS Ventures expects to get $137,000 a month from the two supergraphic signs, which might explain the urgency with which they are talking about putting them up. And speaking of money, DS Ventures spent $458,000 lobbying city agencies on behalf of that project and others from the beginning of 2006 to the end of 2008, according to City Ethics Commission reports. Of course, that’s only a little more than three months of revenue from those signs.